Shimano Dura Ace wheels cover both clincher and tubular types, with the 7800, 7850 and Carbon versions. The Dura Ace 7800 is a high performance front wheel, ideal for racing or shaving weight. The 7850 is available in carbon and carbon laminate in both clincher and tubular versions. The Dura Ace 7850 carbon comlements the 10-speed groupset meeting pro road race criteria. 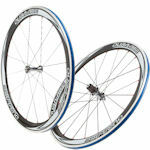 Featuring: 50mm deep carbon rim, alloy braking surface for sprinters and TT specialists, 16 front stainless steel butted and bladed straight pull spokes, 20 rear with 2 cross lacing pattern improving lateral and torsional (power transmission) rigidity, Elbow-less spokes for a strong yet compliant wheel, High lateral rigidity with a 3 mm offset asymmetric rim and wide flange spacing, Improved Freehub body, quick pawl engagement for instant power transfer, Labyrinth double contact sealing, Borozon treated bearing races, Cold forged and machined aluminium hub shell and oversized 7075 alloy axle combined with a titanium freewheel body, weight 1580g, 8,9 and 10-speed compatible rear wheel, 700C tubeless compatible. The 7850 tubular is an adaptation of the clincher.